When it comes to versatile fold-out storage systems for your space, Elbowroom has got the products you need. Introducing fold-out storage systems. Ideal as a work cupboard, these solutions are intelligently designed fold-out storage products designed to maximise your space and efficiently hold your goods. Need a value-for-money cupboard that offers workplace safety as well as security for the items inside? This metal cupboard provides that and more with its heavy-duty construction and lockable doors. 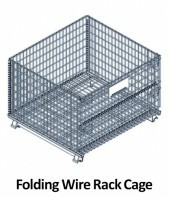 If you need a solution that is portable, consider a folding wire rack cage. These versatile storage cages are compatible with pallet racking systems and forklifts, and they are stackable as well. They are ideal for storing and moving odd-shaped items. Foldable storage lets you create an efficient workplace – you can use what you need while any items that aren’t in use can fold away to be kept aside until needed. Each storage solution is strong and durable, constructed from quality materials that cater for general warehouse purposes. 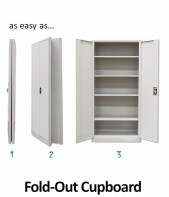 Click through to each fold-out storage product for dimensions and a product description. If you’re ready to get loose items off the floor and safely stored, browse and shop these collapsible storage options online through Elbowroom. 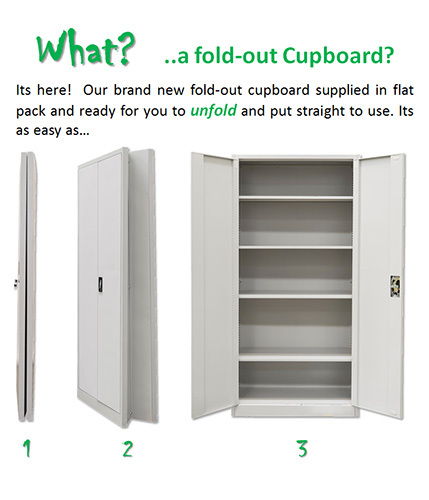 For more information on our range of fold-out storage and other storage solutions, contact us online or on 1800 810 331. Delivery throughout Brisbane and Australia wide.